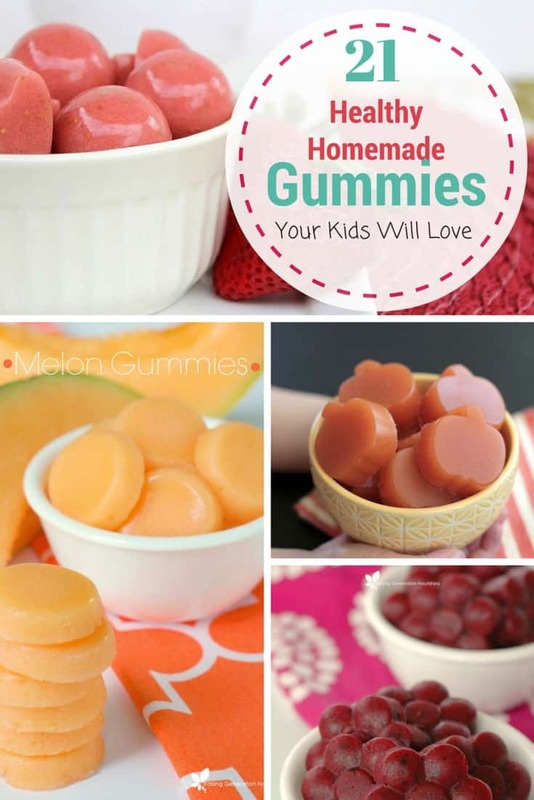 You are here: Home / Healthy Easy Recipes / 21 Healthy Homemade Gummies Your Kids Will Love! 21 Healthy Homemade Gummies Your Kids Will Love! All of my kids love gummies. It doesn't matter if it's gummy bears, gummy worms or any kind of gummy snack. Luckily you can easily make homemade gummies that are SO much healthier. Put your hands together for DIY gummies! Fruit snacks. You are rarely going to find a kid that doesn't like fruit snacks. Now me, I am not a fan of gummy snacks or any chewy candy for that matter. Give me chocolate any day. But for those who enjoy a chewy snack, luckily there are a ton of healthy homemade gummy recipes that are super easy to make. Think about all of those packages of fruit snacks that are just sitting there in the food aisle, waiting to be bought. Have you ever picked up a box and actually read what is in them? Let me tell you…not much of anything really. Dyes and other words I can't pronounce line the ingredient list and make for a less than stellar experience trying to convince myself that these gummies are something that my kids even need. For all those times that I've been tempted to buy and send with my kiddos to school…I'm not going to let that thought process happen again. In fact, I've realized that each and every time I have the chance to make something myself, it turns out better! Say goodbye to chemicals, so goodbye to dyes and say hello to a fresh new world of eating healthier! Will your kiddos like the taste of homemade gummies? While I can't say for certain, I can assure you that my kids love them. In fact, they love them so much that they've forgotten that the store brands even exist. I no longer get asked to pick them up when I go to the store…Now I get asked to pick up the ingredients needed to make our homemade gummies instead. Talk about an amazing feeling and transformation! The last of these gummy recipes literally helped to change the taste buds of my kiddos. And for the better! I'm convinced, without a doubt, that they actually like to eat their fruits and veggies when it comes to making these homemade gummies! Gelatin is considered by many to be a superfood, but you don't just want to use any old gelatin in your gummy recipes. Be sure to choose a high-quality grass-fed gelatin like this one. Enough chit-chat, now on to the Chewy Goodness! 21 Healthy Homemade Gummy Recipes Your Kids Will Love! With all of these healthy homemade gummy recipes, you're certain to find one (or two!) that your kids will ask for on a consistent basis. And who knows, maybe they'll love each and every one of them! Now have some fun making your own Healthy Homemade Gummies! Start with one that you know will be a hit, and work down the list! Packing Healthy Homemade Gummies for picnics, school lunch, fun outings or even ask a great gift for others is always a great idea! When you have the ability to share some delicious and healthier food options for your family and friends, make it happen! You never know…they may not even know that recipes like this are even an option. Have you ever made your own homemade gummies? Do you or your kiddos have a favorite flavor? I am a wife, mother, web designer, whole food lover with a passion for sharing natural and safe alternatives to conventional beauty products. « 12 Essentials for a Relaxing Beach Vacation With Baby! This is such a fun collection! I can’t wait to make some for my kids. Oh fun! I don’t make these often enough! Thank you for all the recipes! My daughter loves gummies! I can’t wait to try some of these awesome recipes! Great round up! We love homemade gummies and I love all of the new ideas! Love this round-up! Great way to get gelatin into our little ones’ (and big ones’) bodies. Great for kids and grown-ups too! This is a great array of gelatin treats for kids and grown ups and without all the toxic additives and food dyes. Thanks for sharing on Real Food Fridays. Pinned & tweeted. Hi Mindy – Thanks so much for sharing with the Let’s Get Real party. Oh those look delicious! My kids would love those! Love!! Thank you for linking up at my craft party! I pinned your entries! Hope you can make it again on Thursday at 7pm EST.! How long do these last for? can i make a big batch and store them or should i make them regularly? There are no recipes coming up for me to see. Hi. I just came across your link via pinterest. I was just wondering could you use any silicone tray for these? I just brought the gummy bear tray but I see there are many different shapes that you can do and try. Sure, you can definitely do that! My kids love gummies and I spend a lot of money buying them. This is really a big help. I will try this with my kids over the weekend. These recipes look amazing! Is there a way to make them vegan by using fruit pectin instead of gelatin? I’ve been able to swap out gelatin for pectin in several recipes, like jelly, and was hoping to make these awesome treats for my little ones soon. Any thoughts?